On June 13, 2010, the “Hayabusa” asteroid explorer returned to Earth. Seven years after lift-off in 2003, and after surviving various mishaps, a bleeding and battered Hayabusa successfully returned to fire up the imagination of the Japanese people. The samples retrieved by Hayabusa from the asteroid Itokawa were minute in size and volume, but the Curation Facility (asteroid substance sample receiving facility) developed and delivered by the project team headed by Hitachi High-Technologies successfully analyzed them. An accident occurred in November 2005. Hayabusa arrived without incident at the asteroid Itokawa, about 300 million kilometers from Earth, and touched down on the surface. The plan then called for it to fire a metal “bullet” and catch the resulting particles. Due to some accident, however, the bullet never fired. If sample collection failed, there would be no need for the Curation Facility, on which development had proceeded since 2002. “But the education team at the Japan Aerospace Exploration Agency (JAXA) refused to give up hope, saying that ‘even though the bullet never fired, it is possible that microparticles stirred up by the touch-down impact were collected.’ They assumed that these were microscopic particles could not be seen with the naked eye,” Tsutomu Tanaka, then manager of the Science Systems Sales & Marketing Division, Science Systems Sales Dept. 2, recalls. Heartened by these words, the development team imagined what these microscopic particles might be and proceeded with a modification of the facilities so that collection, observation, and processing could be performed. 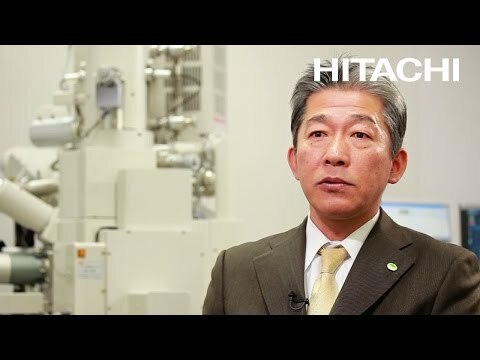 In anticipation of the development of the Curation Facility, JAXA contacted Hitachi Plant Technologies, Ltd. (now Hitachi Infra Systems Co.) by telephone, requesting that they prepare an estimate for a clean room. The issue was facilities for analysis and storage of the samples brought back home by Hayabusa, and equipment for handling the samples, a scanning electron microscope, etc., would be needed. 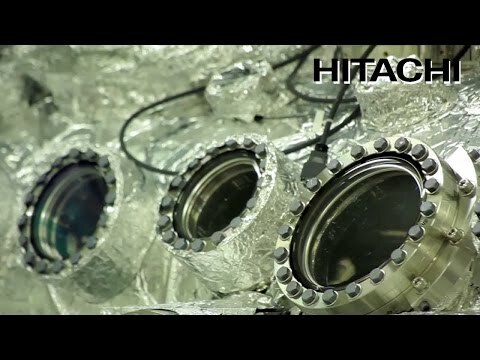 The Hitachi Central Research Laboratory (CRL), Hitachi High-Technologies Corporation, and also Miwa Mfg Co., Ltd., which had performance experience with the JAXA glovebox, became involved in 2002. Hitachi High-Technologies became the contract leader, making proposals on behalf of the project team. Just when the specifications had been firmed up, news of the Hayabusa accident arrived. If the samples were microparticles, there was concern that careless opening would cause them to scatter. How to collect microparticles invisible to the eye was also an intractable issue. On the technical side, CRL led efforts to handle these difficulties, revising the container opening method and studying the use of needles bathed in static electricity as a way to gather microparticles. In the end the method used for collection was a spatula on the inner wall due to consideration for efficiency, but selection of a spatula material that would not contaminate the sample was a constant worry. At some points discussion on the composite team became quite heated, with the situation reaching the danger level. “We had to use care in coordinating the opinions of the team members. Whenever the situation hit a wall, or a difficulty was surmounted, we fell into the practice of going out together for drinks to lubricate the situation,” said Tanaka. During this time Hayabusa was steadily approaching Earth, and it was scheduled to arrive in 2008. The team was somehow able to finish modifying the specifications in 2007 and make delivery of the equipment. After that a whole year was spent incorporating the opinions of the researchers who would actually be performing the operations and proceeding with continuous fine adjustments and revisions. Hayabusa was encountering troubles one after another, including engine problems, fuel leaks, dead batteries, and communication losses, but it miraculously continued its fl ight. “At times we were sure that it could never make it back to Earth. In the end the return was delayed into 2010, giving us plenty of time to run repeated simulations,” Tanaka recalls. Hayabusa used its final power to return to Earth on June 13, 2010, and the capsule was retrieved without incident from the Australian desert. The container arriving at JAXA Sagamihara was opened at the Curation Facility, and just as anticipated, nothing could be discerned with the naked eye. A spatula was used to carefully scrape the inner wall, and observation with the S-4300SE/N revealed more than 2,000 particles. The analysis of the particles showed that they came from Itokawa. In December 2010 JAXA awarded Hitachi High-Technologies a prize for the Hayabusa Project. “The team responded to the rigorous specifications demanded by JAXA, and were able to deliver the best possible system. This was an achievement combining manufacturer functions and trading company functions, with Hitachi High-Tech Fielding Corp. also active in system maintenance and control. The Itokawa sample has been distributed to researchers throughout the world, and has given rise to diverse asteroid research. In 2015 ‘Hayabusa 2’ was launched, and we hope to be able to contribute to this project as well. In addition, one project achievement, the electron microscope atmosphere blocking system, has come to be widely used in research involving lithium batteries, catalysts, and other advanced materials,” Tanaka said, showing how wide its effects have been.